13 is a lucky number when it comes to online Rummy. Our proud winners hail from all across India and have won amazing cash. They have made it to our prestigious Rummy Hall of Fame! Huge congratulations to all of them; their position on the list is well deserved. These players played all variations of the Indian Rummy game, including Points, Pool and Deals. Each of them has different preferences and played at tables choosing fun avatars. Many played free rummy games for practice before opting for cash games. 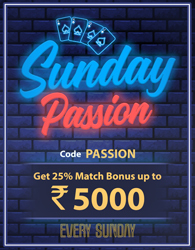 You too can derive inspiration and sharpen your skills, learn to use our expert tips and strategies in our Rummy Gyan section and get a place amongst the top ranked winners of RummyPassion.com. Better still, you can sign up and play against them. Give them some competition and take home attractive cash awards today! What are you waiting for?